This small solar cell can be used in a variety of interesting activities demonstrating the conversion of light to energy. Students can use it to power a small motor, build a simple electronic circuit, or in other solar energy experiments. 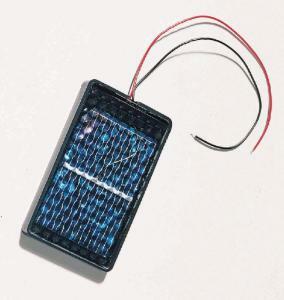 The solar wafer is sealed in a clear acrylic case with two wire leads. Output in full sun is up to 200 mA at 0.45 VDC.